I’m sitting in the Boston airport waiting for my flight to Atlanta, and I couldn’t be more excited for the adventure to come! I’ll be spending a few days in Atlanta before I head out from Amicalola on the Approach Trail early next week. In the meantime, I wanted to share the gear that I think I’ll be carrying with me for my hike. Originally, I had purchased an Osprey Aura 50 because I had used the same model in previous overnight trips, and love the anti-gravity suspension system. It’s probably the most comfortable pack I’ve worn. But as my start date grew closer, and I became increasingly anxious about my base weight, I just couldn’t justify carrying a four-pound plus pack. The Mariposa seemed like the perfect intro pack toward the ultralight lifestyle, weighing around two pounds but without losing all the bells and whistles of heavier packs. The Mariposa has a zipper pocket in the top flap, as well as three separate side pockets and a stretch front pocket on the outside. It’s not quite as comfortable as my Osprey, but it carries well and I have no complaints. With some more research and the handy comparison feature on REI.com, I decided to switch to the Big Agnes Fly Creek HV UL 2, which was the same weight as the Quarter Dome SL 1. Double the space for the same weight. Setting up the Fly Creek really sealed the deal. I couldn’t believe how much space I had. Plenty of room for me and even my pack with room to spare. To start, I’ll be using the REI Joule 21. It’s a pretty standard down sleeping bag rated to a comfort level of 21 degrees, which should be plenty warm. I also decided to delve into the world of quilts and purchased an Enlightened Equipment Revelation 10-degree quilt. Unfortunately, my quilt was set to arrive the same day that my plane takes off for Atlanta, so I’ll have it sent to me along the trail. I’m going to keep my mummy bag until after the Smokies since I am inexperienced with quilts, but I can’t wait to give it a try. The Therm-a-Rest NeoAir Xlite is a classic among thru-hikers and backpackers so I don’t think much explanation is needed here. I’m a side sleeper so I find it super comfortable, and don’t really notice the crinkly potato-chip sound much at all. I’ll also be carrying a small ExPed pillow. I won’t go into too many specific details here, but I’ll outline what my system looks like for layering and warmth. Cooking and water: MSR Pocket Rocket, MSR Titan Kettle and Sawyer Squeeze. Originally I thought I would bring my JetBoil MiniMo, as I had experience using it before. I also had an irrational fear of knocking over my pot and spilling boiling water on myself (thanks to a hiking injuries video by Dixie!). Eventually, the weight penalty of the JetBoil just didn’t seem worth it anymore so I made the switch to a much lighter cook system, and I’m glad I did. I cooked a few rice sides in my kitchen at home and everything worked perfectly. I’ll bring the standards such as my iPhone and a power bank (Anker 10,000), but I’ll also be carrying my Kindle Voyager as a luxury item. Reading at the end of the night will be a nice way to pass the time in the beginning, when I anticipate doing lower mileage and having a lot of spare time. I’ll likely send my Kindle home eventually, but I’ll see how it goes. I’m already anticipating sending a handful of items home, especially once the weather warms up. 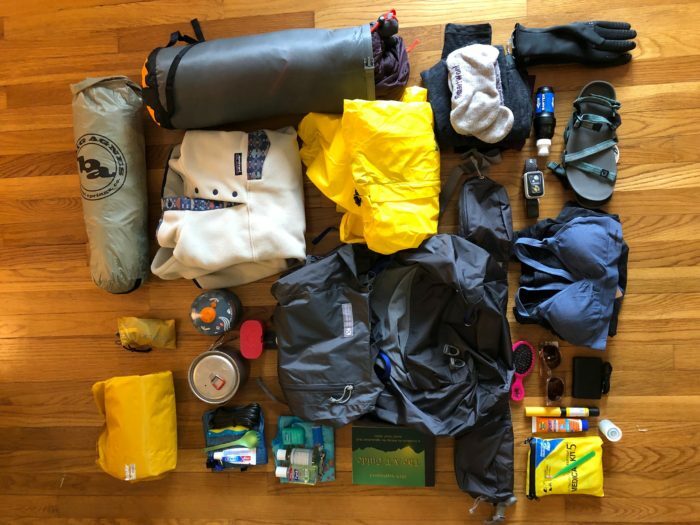 I’m interested to see what makes it with me all the way to Katahdin, what I add along the way, and what I ditch in the first week. I will be posting about once a month with updates of my journey, but if you’d like to keep more up to date with my adventure give my Instagram a follow. I'm Bridget. I discovered hiking the summer before I left for college and have been hooked ever since. I've been working my way through the 48 4,000 foot mountains of New Hampshire and currently sit at 36/48. Outside of hiking in the mountains, I also enjoy sleeping, music, hockey, being cozy, disc golf, 90s rom-coms and reading. I left my job at a successful tech startup to attempt a thru-hike of the Appalachian Trail. I'll be going NOBO in 2019!